Pack of five Lathem proximity key fobs for use with LX100 door lock and PC500 system. Pack of fifteen Lathem proximity badges for use with Lathem LX100 door lock and PC50 system. 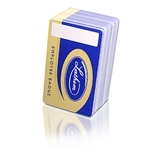 Pack of Fifty Lathem badges for use with Lathem PC100 system. Numbered #51-100. Lathem 100 Employee Software Upgrade Code allows your system to have 100 active employee licenses. Upon purchase, unlock code(s) are provided. Lathem 150 Employee Software Upgrade Code allows your system to have 150 active employee licenses. Upon purchase, unlock code(s) are provided.